it has been too long, but, oh my, do we have something special for you. 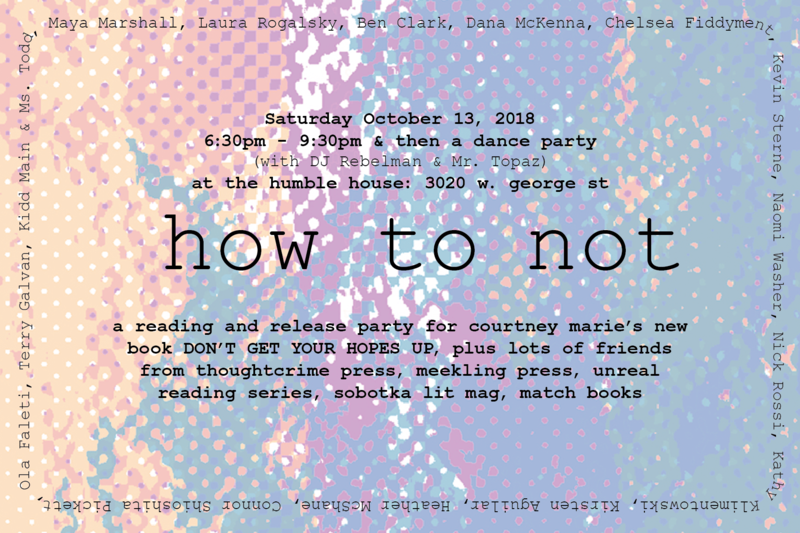 On October 13th, courtney marie will be traveling up to Chicago to celebrate the release of her amazing chapbook Don’t Get Your Hopes Up. Joining her will be authors from Thoughtcrime Press, Meekling Press, the Unreal Reading Series, Sobotka Lit Mag, and Match Books! And a dance party to follow the reading! Please join us at the humble house for this weirdo extravaganza. In other news, all of our current titles can now be found over at Small Press Distribution. Woot woot. Not My President, The Anthology of Dissent is finally available. We’ve gathered voices from around the world in this anthology, including National Book Award winners, visual artists, New York Times Best Sellers, poets laureate, singer-songwriters, high school students, and children of illegal immigrants, all united in their opposition to the policies of Donald Trump. We’ve shipped off copies to every member of Congress, and the Tweeter-In-Chief, and all remaining profits will go towards non profit groups facing backlash under the current administration. Click the book cover to purchase a copy for yourself. Congratulations to the winners and finalists of the 2017 Lorien Prize! It was a wonderful few months of reading for us at Thoughtcrime Press, and the lovely writers above represent only a small portion of the incredible work we received for the Lorien Prize, and continue to receive for the Not My President Anthology. Thank you to everyone who submitted. It was an honor and a privilege to read your manuscripts. Now, back to work, crafting beautiful books that celebrate our authors, and their unique, exhilarating takes on language and storytelling. Thoughtcrime Press is accepting submissions for our new anthology, Not My President. We want poems and short work (essays etc. under 2000-ish words) that discuss the election of 2016, the truths and fears and anger regarding going forward after the election of Donald Trump, and the shift that has occurred in many friend groups and families because of that election. We want your thoughts on the future, your reflections on the past, and your words of resistance. We want to collect voices of dissent while we still can. We want to share them with the world. A moment of historical significance has occurred, and we want to acknowledge and preserve the reaction to it. We want this book to be referenced in the future as part of our history. People need to speak out, and never stop. We are not trying to be balanced in our approach to a Trump presidency. Any work glorifying Trump won’t be considered for this publication. We are also saying officially that as a press, Thoughtcrime does not support Trump or his messages of hate, war, misogyny, racism and bigotry. We reject fascism and we embrace the equal rights of all people. If this alienates some who support our press, then we accept that. We don’t need their support to be successful. All accepted authors will receive a digital copy of the anthology and be able to purchase the printed book from us at print cost +$1. Profits will be donated to Planned Parenthood and groups supporting Black Lives Matter and public water rights. -Each author should send between 3-5 poems or one short piece, or any combination thereof, pasted into the body of an email. Attachments won’t be opened. If special formatting is required, send a quick note that explains it and we will request a pdf/word doc. -We accept previously published work as long as you mention where it was first published and have full rights to reprint it. -Simultaneous submissions are encouraged. Just let us know if somewhere else picks it up. -The book will be crafted with absolute care for the text, and will stay in print as long as Thoughtcrime remains a press. Deadline Extended to Jan 31st for Lorien Prize Chapbook Competition! 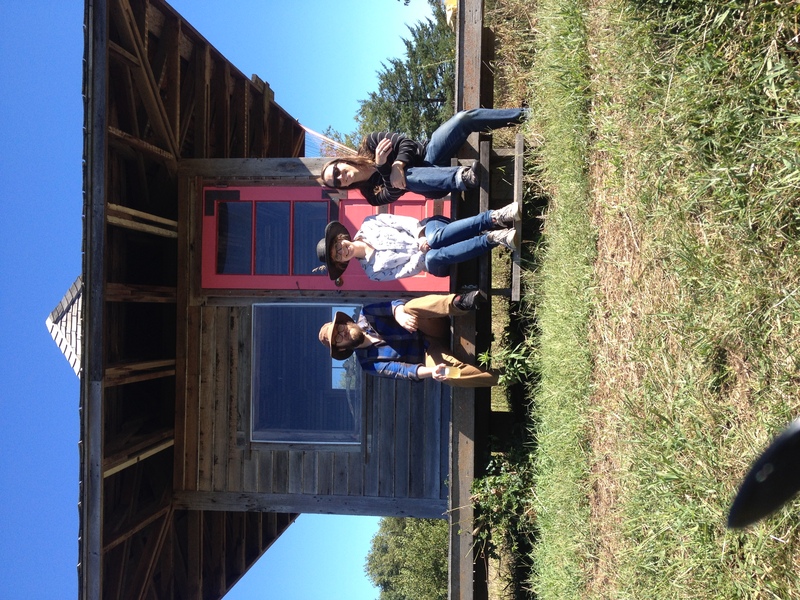 Thoughtcrime founder Josh Gaines is interviewed for Entropy Magazine. We at Thoughtcrime Press are thrilled to announce that we’ll be accepting submissions from December 15th–January 31st for our first ever chapbook competition, the Lorien Prize, and we’ll publish not just one, but two winning authors! We will present the two collections in the summer of 2017 as a single back to back volume, using a tête-bêche binding. This format allows us to join two works whose themes or styles converse with each other, expanding the presence of both in a final book in an otherwise impossible way. If you know someone whose writing would go well with your own, submit together. We are excited to see what you have in mind! -Submit alone or with another author. -If submitting with another author, still only $10! -Each author should send between 15 and 29 poems (though if your manuscript falls a little outside these parameters, still submit!). -Winners announced at AWP, February 2017. -Winning authors each receive 50 free copies, guidance with tour preparation and promotion, and access to all benefits of the Thoughtcrime family of authors and artists. -The book will be crafted with absolute care for the text and authors’ wishes, printed with an ISBN, and will stay in print as long as Thoughtcrime stays a press. Rather than describe what we’re looking for in a manuscript, it might be more helpful to list a few things we’ve been reading lately, and obsessing over.